The third in a series of installations by major contemporary sculptors, Bruce Nauman presents three important large-scale sculptures created by one of the country’s most important sculptors and performance artists. 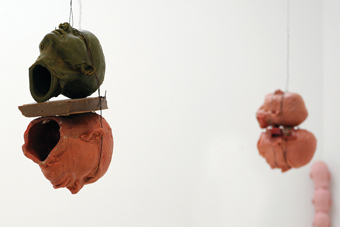 A 1966 graduate of the University of California, Davis, Bruce Nauman rose to national prominence with sculpture, performance, and video works that investigated psychological states and behavioral patterns. Often mischievous and disturbing, Nauman used his own body and life situations to reinvigorate the formalist aesthetics of minimalism. The three works on view date from 1980 to 1990 and evidence Nauman’s explorations of formal structure and materials through building abstract forms as well as human and animal bodies. Manipulating materials and visual symbols, he undermines our sense of stability physically and emotionally in Animal Pyramid and Four Pairs of Heads. A leading post-modern artist, Nauman’s work has been the subject of major retrospectives at The Museum of Modern Art, Tate Modern, and Los Angeles County Museum of Art. Organized by the Portland Art Museum and curated by Bruce Guenther, chief curator and The Robert and Mercedes Eichholz Curator of Modern and Contemporary Art. Sponsored in part by The Paul G. Allen Family Foundation.